Buying a whole or half a hog can be a daunting task. I’ve put together a couple of examples of cut orders I typically use. With these examples and tips I’m hoping to help you feel more confidant when ordering your hog. When you call in your cut order, this is what the processor is looking at and filling in. Package Size/Cuts: Think about the volume of food your family typically eats at a meal. You can have your meat packaged accordingly. For example, if you have five people in your family, you may want to package 5 pork chops per package. For something like pork steaks or ham steaks keep in mind these are a huge cuts of meat. In my family we will usually split a steak between 2 people. Roast size is important to consider, especially if you are keeping your hams (cured or uncured). Hams are usually around 20 lbs in size so, unless you plan on having a ham at a large family gathering, you will want that ham broken down into smaller roasts. I personally request 4 lbs roasts. How much sausage do you want? If you are a big sausage lover but hate pork chops you may want to consider just having that cut of meat ground up (or any other cut you dislike). Note that some cuts of meat or sausages have an additional cost associated with them. The extra charge is in parenthesis next to the cut. For example any large linked sausage like brats or german rope sausage is an additional $1.99 per pound. When I give an estimate of processing costs I include regular things in that cost like bacon, ham and a normal amount of breakfast sausage. So just keep in mind that if you go crazy on the speciality sausages your processing costs will be higher. Offal: There are certain things that you will not get back unless you request it. This includes fat, organs and bones. So be sure to give instructions to keep those items if you want them. For fat, I always request to have it coarse ground. This makes rendering much easier and efficient. When requesting to keep the organs you will only get back the heart and liver. Other organs require special cleaning and the processor does not have the resources or equipment to clean them. Some people like to have their organ meats added in with all their other ground meat. From personal experience I have found that you cannot keep absolutly everything. For example I cannot get back my pigs feet. The processor would need to buy an expensive piece of equipment to properly clean the pig feet so they do not offer that service at this time. Don’t get too disappointed if you request something and cannot get it back. It’s often not the fault of the processor. You wouldn’t believe the amount of government bureaucracy processors have to deal with! Extras: There are a couple of things that I regularly request that are not on the cut order. That is Italian sausage and cutlets. Italian Sausage can be made into large links (like the size of brats) or bulk packages. Cutlets are made from uncured hams. They are sliced off the ham and ran through a meat tenderizer. With this mind, if there are cuts of meat that you like that you do not see on the cut order, ask about it. Usually the processor can help you out. But also keep in mind that sometimes when you get a certain cut of meat that means that you cannot get another. For example if your request the tenderloin, you cannot get pork chops. They are from the same part of the animal. Bringing your meat home: Figure on needing one 150 qt cooler per half. If you live within an hour of the processor and you don’t have a cooler, don’t worry. The meat comes in big cardboard trays so just pile the trays of meat in the back seat or trunk of your car and cover with some heavy blankets. The meat will stay frozen until you get home. 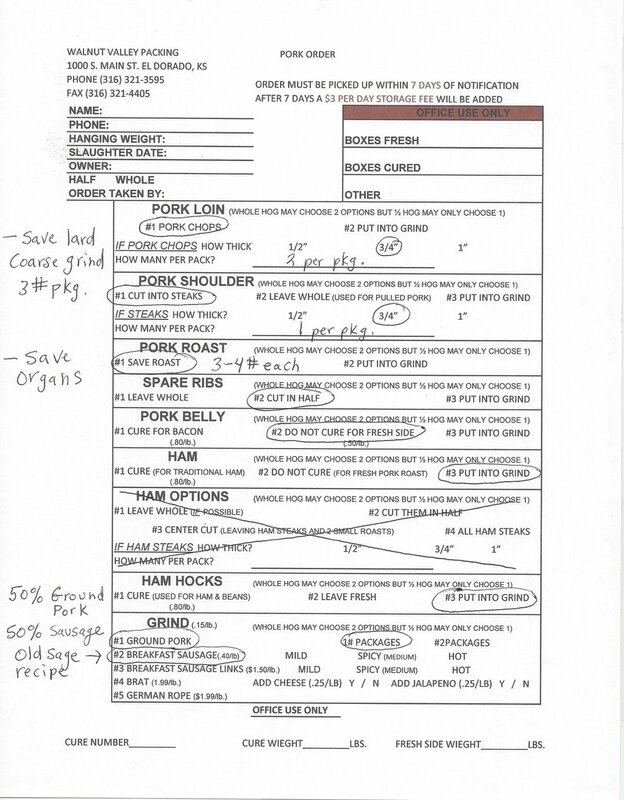 Above is an example of a cut sheet I would fill out if I wanted ham and bacon. 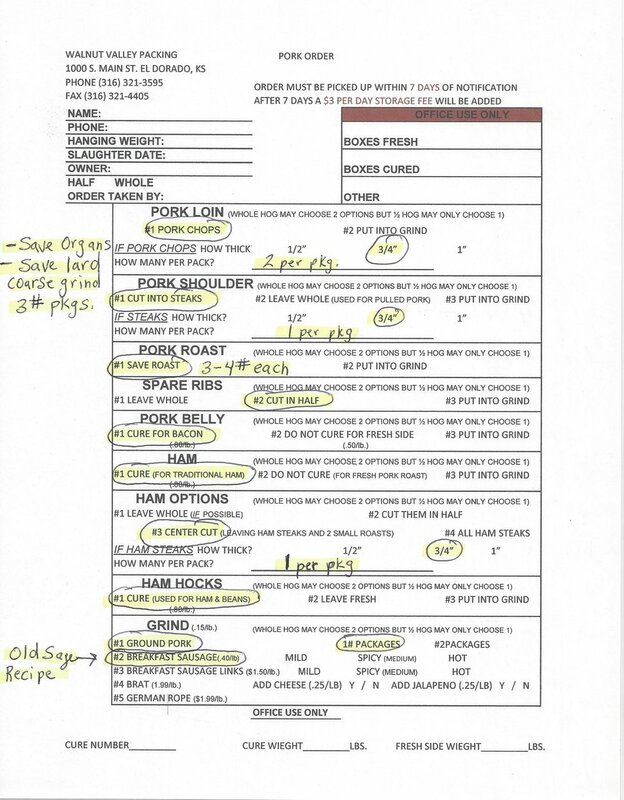 Above is an example of a cut sheet that I would fill out if I wanted no cured meats. Uncured meat is referred to as “fresh”. So for example, Fresh Side is just uncured bacon. Fresh Ham is just an uncured roast.